(83 MILE HOUSE) Snowmobilers and others using the Gold Rush Snowmobile Trail have a new place to warm up and stay dry thanks to the Jobs Creation Partnership (JCP) Project. The JCP Project marked another milestone Friday with the opening of a warming hut installed on the trail at 83 Mile House. 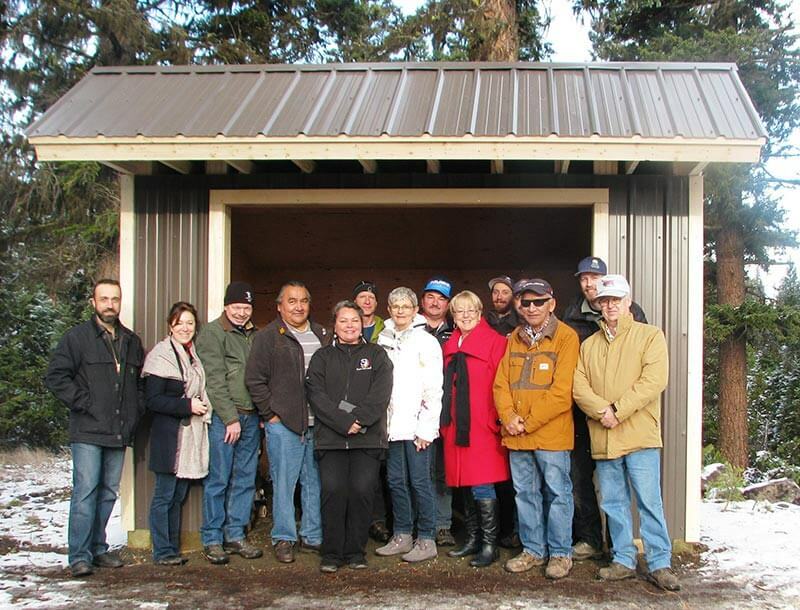 Minister of State for Rural Economic Development Donna Barnett (MLA, Cariboo-Chilcotin) and Government Caucus Chair Jackie Tegart (MLA, Fraser-Nicola) were among the dignitaries who inspected the hut on November 25 at the access to the trail. The warming hut is one of four such structures being built along the Gold Rush Snowmobile Trail (GRST). In addition, the JCP Crew will be installing information huts along the route, which runs from 70 Mile House to Likely. The Gold Rush Snowmobile Trail is a multi-use trail that offers a variety of recreation experiences year-round. It’s managed by the GRST Regional Management Committee, which is implementing a business plan completed in 2012. “The JCP Project is an example of the importance of partnerships ‎in moving towards diversifying our economy,” said Barnett. The warming huts are among dozens of new amenities for heritage and recreation sites being constructed under the JCP Project. The $400,000 initiative – the largest such project in B.C. – is providing employment and skills training for five EI Participants in the Cariboo. “This project is creating improvements to the region’s heritage tourism and recreation infrastructure that will help First Nations and other communities to attract more visitors and generate more employment,” said Cheryl Chapman, NPTGS First Nations Co-chair. The project partners also announced that the JCP Project will be extended by another 12 weeks. Originally scheduled to wrap up in December, the project will now carry on until March 31, 2017. This will provide another 2,400 person-hours of training for the EI Participants. It will also allow the crew and their supervisor Thomas Salzbrenner to complete several outstanding projects which were delayed by weather conditions. “We’re delighted that this project will now be able to continue on into the spring and finish the job,” said Raymond. To date, the JCP Project has generated nearly 7,900 person-hours of valuable skills training for the EI Participants and their supervisors. The EI Participants are working on four separate phases that will see upgrades to heritage/recreational sites and First Nations communities in the region. They’ll gain experience in log building and trail construction as well as learning other valuable skills during the project. The JCP Project is a partnership between the Ministry of Social Development and Social Innovation, NPTGS, Canim Lake First Nation, Gold Rush Snowmobile Trail Regional Management Committee, Highway 24 Ice Caves Project and the Government of Canada. The Recreation Sites and Trails Branch of the Ministry of Forests, Lands, and Natural Resource Operation are also project partners.